Check out Christina's full look at Looks By Lau! 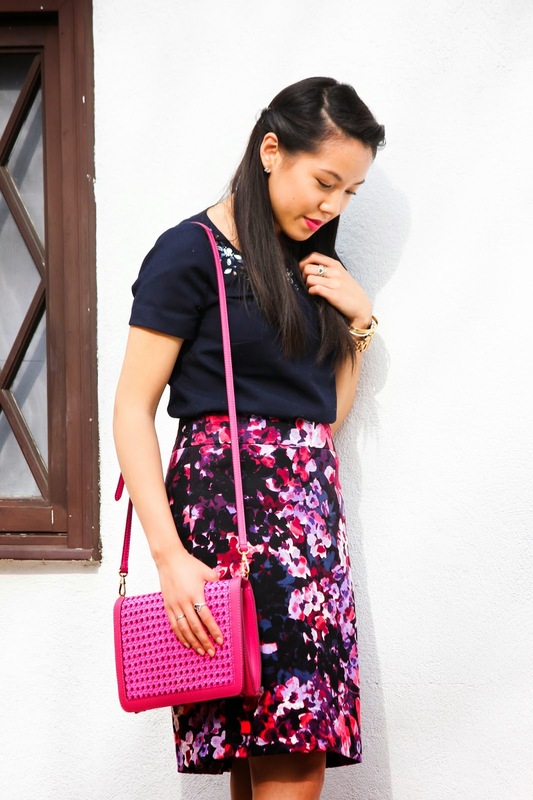 Today is the second collaboration post with fellow style blogger Christina from Looks by Lau. As a theme we chose pencil skirts, which I feel have become more of a youthful trend as of late - meaning it's being dressed up and/or down in many more versatile ways than just office wear. When it comes to pencil skirts, I shy away from the blacks, greys, and navys because to me those scream corporate culture and I'm really not about that life if you know what I'm saying. 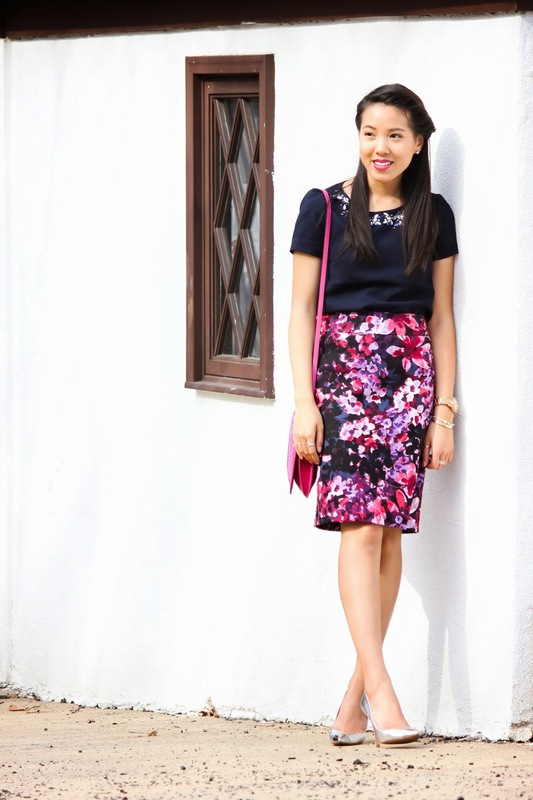 This pencil skirt is much more up my alley with the fun painted florals in pops of fuchsia and lavender. I personally would love to pair this skirt with a lavender top, but I don't own much lavender so I opted for a navy. The great thing about prints is that you can easily pair it with any color that's already been incorporated into the design, essentially providing you a set palette for mixing and matching. It pretty much makes color a no brainer and you can simply focus more on silhouette. I chose a dressier route because I wore this for church-going, but for more casual days you can simply pop on a slubby white tee, some jewels, and you're out the door. 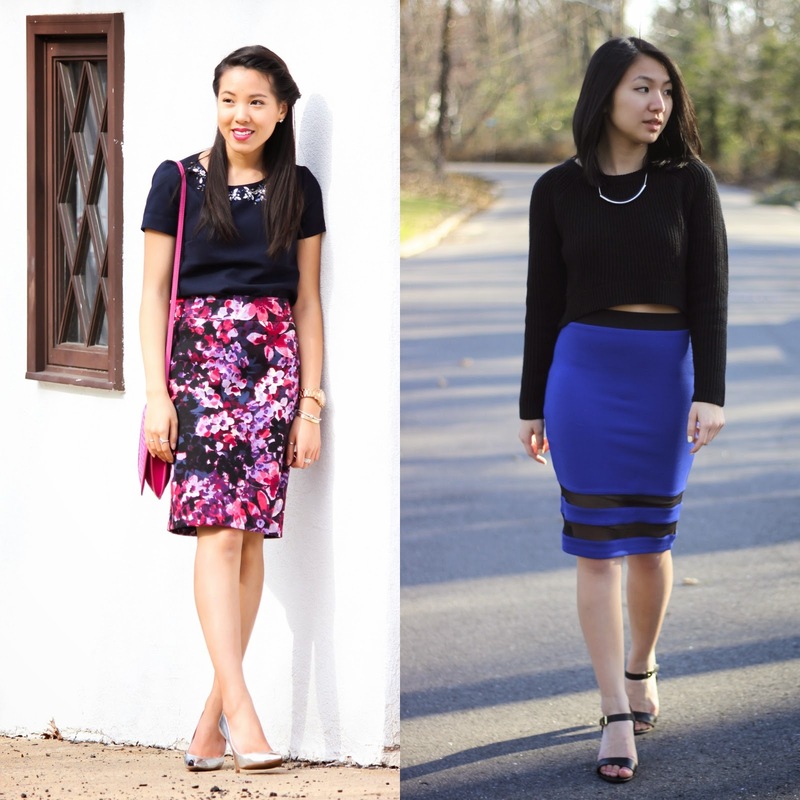 How do you style your pencil skirts? We'd love to know!! I love the floral printed skirt. The basic black top really lets it shine!! Those heels are to die for - thanks for putting a link for a similar pair:) I love the outfit. The navy top was a great choice! I agree with your comment about pencil skirts--even though I've been working for awhile, I found them stuffy until recently. 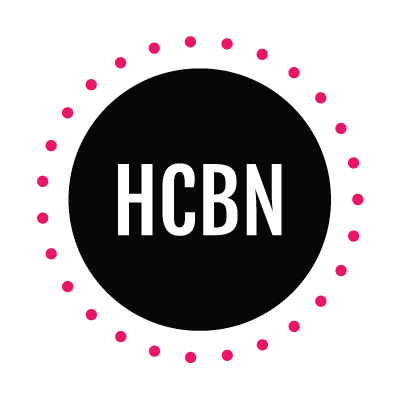 Now there are so many fun colors and designs!